This article is about the medieval practice. For the use of the term in the United States, see Robber baron (industrialist). 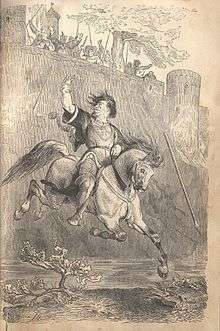 Legendary Raubritter Eppelein von Gailingen (1311—1381) during his escape from Nuremberg Castle. A robber baron or robber knight (German raubritter) was a feudal landowner that, seeking to alleviate their financial difficulties, recurred to banditry protected by his feud's legal status. It is a modern historiographical term based on historians' observations of the German nobility. This development is described to have occurred in the late Middle Ages and have been mainly a result of the natural economy displacement by the monetary economy. Some robber barons violated the custom under which tolls were collected on the Rhine either by charging higher tolls than the standard or by operating without authority from the Holy Roman Emperor altogether. They also went outside that society's behavioral norms, since merchants were bound both by law and religious custom to charge a "just price" for their wares. During the period in the history of the Holy Roman Empire known as the Great Interregnum (1250–73), the number of tolling stations exploded in the absence of Imperial authority. They could resort to robbing ships of their cargoes, stealing entire ships or kidnapping. The term Raubritter was coined by Friedrich Bottschalk in 1810. For one thousand years, from around 800 AD to 1800 AD, tolls were collected from ships sailing on the River Rhine in Europe. During this time, various feudal lords, among them archbishops who held fiefs from the Holy Roman Emperor, collected tolls from passing cargo ships to bolster their finances. Only the Holy Roman Emperor could authorise the collection of such tolls. Allowing the nobility and Church to collect tolls from the busy traffic on the Rhine seems to have been an attractive alternative to other means of taxation and funding of government functions. Often iron chains were stretched across the river to prevent passage without paying the toll, and strategic towers were built to facilitate this. The Holy Roman Emperor and the various noblemen and archbishops who were authorised to levy tolls seem to have worked out an informal way of regulating this process. While this decision process was made no less complex by being informal, common factors included the local power structure (archbishops and nobles being the most likely recipients of a charter to collect tolls), space between toll stations (authorized toll stations seem to have been at least five kilometres apart), and ability to be defended from attack (some castles through which tolls were collected were tactically useful until the French invaded in 1689 and levelled them). Tolls were standardized either in terms of an amount of silver coin allowed to be charged or an "in-kind" toll of cargo from the ship. In contrast, the men who came to be known as robber barons or robber knights (German: Raubritter) violated the structure under which tolls were collected on the Rhine either by charging higher tolls than the standard or by operating without authority from the Holy Roman Emperor altogether. Writers of the period referred to these practices as "unjust tolls," and not only did the robber barons thereby violate the prerogatives of the Holy Roman Emperor, they also went outside of the society's behavioural norms, since merchants were bound both by law and religious custom to charge a "just price" for their wares. During the period in the history of the Holy Roman Empire known as the Great Interregnum (1250–1273), when there was no Emperor, the number of tolling stations exploded in the absence of imperial authority. In addition, robber barons began to earn their newly coined term of opprobrium by robbing ships of their cargoes, stealing entire ships and even kidnapping. In response to this organized, military lawlessness, the "Rheinischer Bund," or Rhine League was formed by and from the nobility, knights, and lords of the Church, all of whom held large stakes in the restoration of law and order to the Rhine. Officially launched in 1254, the Rhine League wasted no time putting robber barons out of business by the simple expedient of taking and destroying their castles. In the next three years, four robber barons were targeted and between ten and twelve robber castles destroyed or inactivated. The Rhine League was not only successful in suppressing illicit collection of tolls and river robbery. On at least one occasion, they intervened to rescue a kidnap victim who had been kidnapped by the Baron of Rietberg. The procedure pioneered by the Rhine League for dealing with robber barons – to besiege, capture and destroy their castles – survived long after the League self-destructed from political strife over the election of a new Emperor and military reversals against unusually strong robber barons. When the Interregnum ended, the new Emperor Rudolf of Habsburg applied the lessons learned by the Rhine League to the destruction of the highway robbers at Sooneck, torching their castles and hanging them. While robber barony never entirely ceased, especially during the Hundred Years' War, the excesses of their heyday during the Interregnum never recurred. When the traitors saw that Stephen was a mild good humoured man who inflicted no punishment, then they committed all manner of horrible crimes. They had done him homage and sworn oaths of fealty to him, but not one of their oaths was kept. They were all forsworn and their oaths broken. For every great man built him castles and held them against the king; they sorely burdened the unhappy people of the country with forced labour on the castles; and when the castles were built they filled them with devils and wicked men. By night and by day they seized those they believed to have any wealth, whether they were men or women; and in order to get their gold or silver, they put them into prison and tortured them with unspeakable tortures, for never were martyrs tortured as they were. They hung them up by the feet and smoked them with foul smoke. They strung them up by the thumbs, or by the head, and hung coats of mail on their feet. They tied knotted cords round their heads and twisted it until it entered the brain. They put them in dungeons wherein were adders and snakes and toads and so destroyed them. Many thousands they starved to death. Michael Heller refers to the original robber barons to illustrate his tragedy of the anticommons in his 2008 book. The tragedy of the anticommons is a type of coordination breakdown, in which a single resource has numerous rightsholders who prevent others from using it, frustrating what would be a socially desirable outcome. 1 2 Zmora 2003, p. 3. ↑ Heller, Michael (2008). The Gridlock Economy: How Too Much Ownership Wrecks Markets, Stops Innovation, and Costs Lives. Basic Books. ISBN 978-0-465-02916-7. Look up robber baron in Wiktionary, the free dictionary. Zmora, Hillay (13 November 2003). State and Nobility in Early Modern Germany: The Knightly Feud in Franconia, 1440–1567. Cambridge University Press. ISBN 978-0-521-52265-6. Retrieved 18 September 2015.